Originally, the 2019 National MEChA Conference was to be held at Boise State University in Idaho, though in August of 2018 the BSU chapter announced that they could no longer host the conference. 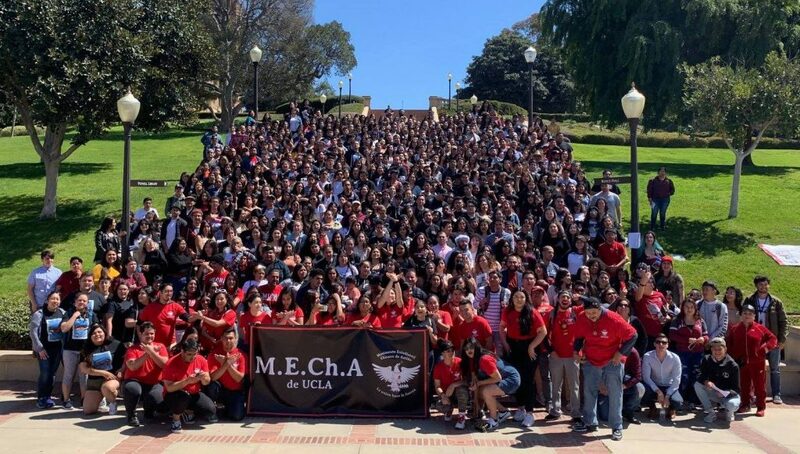 Understanding the historical importance of MEChA’s 50th anniversary, in September of 2018 MEChA de UCLA stepped up and offered to host the 2019 conference, even though they would have half the time to do the work and fundraising necessary to host a national conference. In October of 2018, MEChA de UCLA contacted Unión del Barrio to ask for our support in convening the 26th Annual MEChA National Conference. This request was welcomed because there is a deep political and historical connection between Unión del Barrio and MEChA. Many of the founders of Unión del Barrio had been leading MEChistas, and many current UdB members are MEChA alumni. 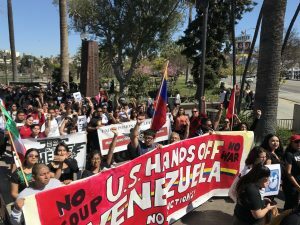 Furthermore, the National Conference was taking place in Los Angeles, and the solid organizational capacity of Unión del Barrio in Los Angeles would clearly be helpful for the comrades at MEChA de UCLA to bring together this large event within the narrow timeframe that had been imposed on them. Unión del Barrio supports MEChA, and we were honored to be invited to participate, and happy to help however we could. 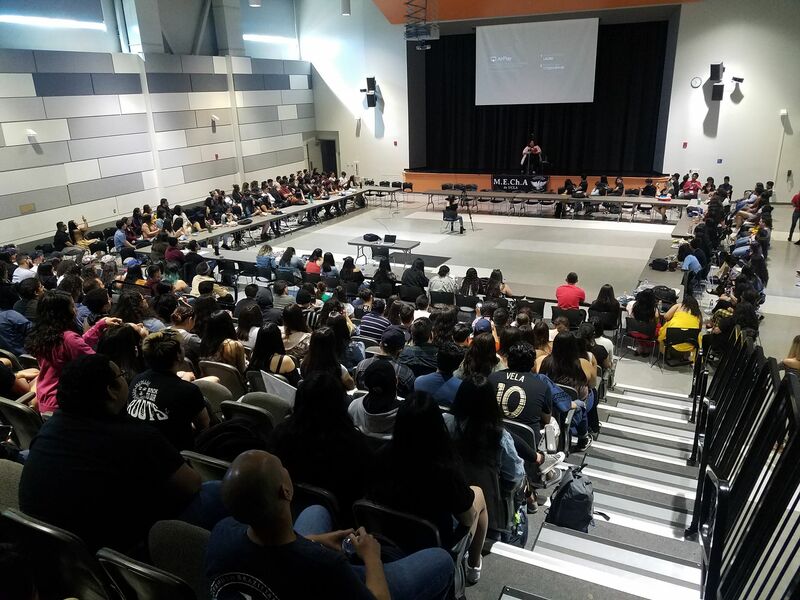 Our organization provided logistical support and political contacts, we provided security for the National Day of Action, and we secured the facilities for the final day of the Conference at Maya Angelou Community High School. Unión del Barrio firmly adheres to the principle of respecting the organizational autonomy of MEChA, though we always retain the right of independent criticism and political analysis. As a result of the historical significance of the 2019 National MEChA Conference, Unión del Barrio feels compelled, for the first time in our 38 years of organizational history, to publish our own report and analysis about the direction of MEChA as a national organization. We feel that the details of what came down in LA during the final weekend of March 2019 are of broad interest to movimiento forces in general, and merit an external report and deeper ideological analysis. The first concern of the Conference presented itself during the afternoon election of the new National MEChA Co-Chairs, which took place during the conference’s dinner break. After the election of the two Co-Chairs, one of the two people elected unceremoniously decided to give up their new position, and without due process, passed the position of leadership to the 3rd place runner-up so that person could assume the position of national leadership. The reasons for that decision are still unknown to us, but this became an unexpected procedural point of contention within the voting process. Some MEChA chapters objected to the third place finisher automatically assuming the Co-Chair position, and the issue was tabled, to be voted on at the “Resolution Circle” that was scheduled for Sunday. There would be serious political implications to what was otherwise a procedural issue. Unión del Barrio has confirmed that the new Co-Chair has a history of declaring their support for U.S. military intervention in Venezuela. They demonstrated this political position during a panel presentation within the General Assembly of the Conference. Lennys Lira, a member of the Youth of the Socialist Unity Party of Venezuela, was asked by the soon to be Co-Chair, if they “supported Maduro even though he was killing his own people,” repeating a slanderous talking point spread by the U.S. government and its imperial lackeys in the corporate media. This is a major concern because now one of the national leaders of MEChA will be in line with current imperialist interventions against Bolivarian Venezuela and Trump’s intensifying threats of military invasion. This is a red-flag for any independent, anti-imperialist political viewpoint because there is an active U.S. directed right-wing political/military intervention currently deployed across Nuestra América (Argentina, Brazil, Chile, Colombia, El Salvador, Honduras, Nicaragua, Venezuela, etc. ), and National MEChA is one of the few campus-based networks that could potentially push back against the wave of pro-interventionist/ pro-imperialist impulses that dominate neoliberal academic circles on campuses across the United States. The stakes are very high right now, and the danger of U.S. military intervention in Nuestra América is growing every day. On Saturday the Conference organizers convened a political action to take place on the streets of Los Angeles. The National Day of Action started at MacArthur Park, in the heart of LA’s predominantly Central American community. By 10:00 a.m. about 500 MEChistas had gathered in front of the Monseñor Óscar Arnulfo Romero statue. After a blessing from the comrades of the American Indian Movement, including a representative of the Tongva people who are the original people of the LA area, the marcha began with Danza Azteca leading the way. The march went through the community, and made a stop at LAPD Headquarters, where a representative of Black Lives Matter spoke to the protestors, along with family members of people who have been murdered by the LAPD. The march then continued, and ended at the Downtown LA Federal Detention Center, where several speakers addressed the students. Our people who are being held captive by ICE at the detention center were not able to speak to the crowd for obvious reasons, but they were able to pound on the windows so that they could be seen and heard by the MEChistas gathered outside the detention center. It was a powerful moment of solidarity between our people locked up within the detention center, and the participants of the MEChA Conference, and it brought many MEChistas to tears. Unión del Barrio was asked to lead the security detail for the marcha, and we were happy to do so, ensuring a safe distance between cops that were following the marcha and students. Let it be clear, the marcha route was never provided to the police and we never communicated with the police. The marcha went on as planned, and there were no injuries, no arrests, no negative incidents whatsoever. After the marcha, the MEChistas went to the La Plaza de Culturas y Arte where they had regional breakout sessions and held a panel discussion about the East LA Walkouts. On Sunday the conference reconvened on the campus of Maya Angelou Community High School in South Central Los Angeles. The last day of the conference included keynote speakers, caucus sessions, and the opening of the highly anticipated “Resolution Circle.” The Resolution Circle is the space where MEChA chapters are represented within a body that carries the highest authority of the organization, and can approve or reject proposals that impact the entire organization. It is important to note that at that point the work of hosting the National Conference undertaken by MEChA de UCLA had largely been completed. Elections of the new board. Establishing a procedure for sexual harassment. 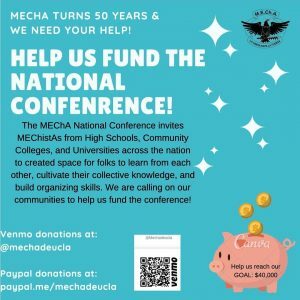 MEChA and the 2020 elections in the U.S.
Bidding for the site of the 2020 National Conference. Prior to the beginning of the resolution circle, MEChA de UCLA proposed that a MEChA alum facilitate the discussion. The rationale was that someone who did not know all of the MEChistas/chapters should preside over the meeting, so they wouldn’t be biased and could facilitate the meeting in an impartial manner. The person that was proposed was Carolyn Torres, a middle school teacher and community organizer with Chicanx Unidos from Santa Ana, CA. She is a former MEChista from CSU Fullerton, who also served as a National MEChA Co-Chair in the early 2000’s. Inviting Carolyn to serve as the facilitator was rejected by the majority of the chapters present. The argument behind the rejection was that because Carolyn was a member of Chicanx Unidos, she would be biased in favor of a Chicanx identity. The National MEChA Co-Chairs would now be in charge of presiding over the meeting. The original agenda was moved aside, and instead the first vote taken was that National MEChA would prohibit heterosexual (cis-het) men from being present at an Encuentro where MEChistas who identify as women and/or LGBTQIA+ would discuss MEChA’s position on LGBTQIA+ issues and revisions to National MEChA documents. The next vote was to recognize the UC Davis MEChista who was the third runner up for the National MEChA Co-Chair position, even though they did not win the election and had openly spoken in favor of U.S. military intervention in Venezuela. The debate that followed was an important resolution introduced by MEChA de UCLA that called for National MEChA to officially take a position opposing capitalism as an economic system. Instead of voting on a resolution that was critical of capitalism, the majority of the chapters agreed to table that debate to instead prioritize the organizational name change. Thus the stage was set for the debate on the changing of the name of MEChA. Since there have been many questions as to why so many MEChistas decided to drop “Chicanx” and “Aztlan” from MEChA, we have listed some of the most prominent arguments made by MEChistas regarding the name change. This is a first hand account, since members of Unión del Barrio were in the room during the debate, though we did not intervene in the discussion. The most consistent critique was that the current name of MEChA excluded and/or was hostile to people from different backgrounds and identities. For example, several MEChistas stated that using the term Chicanx excluded Central Americans, South Americans, and/or that the name “is anti-Black.” Some MEChistas stated that the current name “is anti-LGBTQIA+.” One MEChista argued that many members of Native American, Central American, LGBTQIA+ and Black communities were telling his chapter that the name was problematic and that it was hurting them. They felt that it was their duty to finally change the name. Another MEChistA stated that “Aztlan” is “anti-indigenous, because it erases the history of the Indigenous tribes.” One speaker compared the use of “Aztlan” to the current nation state of Israel which occupies and tries to erase Palestine from history. These positions clearly drew from a document titled “Aztlán” that had been shared online via official National MEChA social media accounts.That document made a highly critical, academically structured argument against Aztlan. No counter-analysis or position paper that was supportive of “Aztlan” was ever shared. Recommendations for possible new names included “Movimiento Estudiantil for Change and Advocacy – MEChA”, “Movimiento Estudiantil for Change in Abya Yala – MEChA” and “Movimiento Estudiantil for Progressive Action – MEPA”. Though the vast majority of the chapters and speakers were in favor of the name change, there were also dissenting voices. Speakers from San Diego State University, UCLA, Maya Angelou High School and UC Davis spoke out against the change. Their general arguments were that “Chicanx” and MEChA was indeed inclusive, and that people of different ethnicities/nationalities have historically been welcome and have joined MEChA chapters all across the country. They also said that if some chapters are anti-Black, anti-LGBTQIA+, etc, that a name change would do nothing to change that in practice. Some also argued that changing the name might hurt their ability to get funds from colleges and universities in the future. The resolutions on capitalism and Venezuela were never discussed, no protocol on sexual harassment was developed, and no chapter was identified to host the 2020 conference. We Urge The Community To Support MEChA de UCLA! Throughout the Resolution Circle multiple negative criticisms and attacks were directed against the hosting chapter, UCLA. Broadly, MEChA de UCLA was accused of being racist, ultra-nationalist, anti-indigenous, anti-Black, anti-LGBTQIA+, etc. These attacks were made despite the tremendous efforts made by UCLA to be as open and inclusive as humanly possible. These accusations trivialized the participation and presence of AIM, Black Lives Matter, the CNI, Danza Azteca, and the PSUV. Moreover, on the first page of the 2019 Conference Program, MEChA de UCLA included the following text: “MEChA de UCLA and the Alta Califas Sur Region acknowledge that this conference is taking place on indigenous Gabrielino/Tongva land. We pay our respects to the Gabrielino/Tongva peoples as the land caretakers of Tovaangar (Los Angeles).” The keynote speakers for Sunday included a Salvadoran poet, Yesika Salgado, and Bamby Salcedo, President and CEO of the TransLatin@ Coalition. The workshop presenters and the speakers at the community events came from various organizations such as Bayan (Filipino revolutionary organization), Lucha for Socialism, Centro CSO, the LA street vendors campaign, and Unión del Barrio. Workshop topics included Central American resistance, Palestinian liberation, undocumented students, Hands off Venezuela, and many more. To accuse MEChA de UCLA of racism, ultra-nationalism, or anti-indigenous, anti-Black, anti-LGBTQIA+ behavior is simply ridiculous. Anyone suggesting such a thing must be challenged for their reactionary dishonesty. We are also compelled to recognize the work and sacrifice of MEChA de UCLA. They did an extraordinary job of making the conference as inclusive as possible and to connect it to the community within a very short period of time. On top of all of this, the chapter is now tens of thousands of dollars in debt because of the elevated costs associated with pulling together the National Conference on such short notice. We call on all MEChA alumni and supporters to make a donation to MEChA de UCLA. UCLA MEChA stood firm to defend the history and legacy of MEChA, and for that reason alone they deserve the support of MEChA Alumni and our broader communities. You can make your donations directly to their Venmo account <@mechadeucla> or via PayPal <@mechadeucla>. We also want to be clear, basing ourselves on observations made by our members who were present during the debate, we are convinced that the vast majority of MEChistas who voted to change the name did not have malicious intentions. 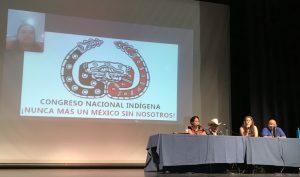 However, many of the arguments made in favor of the name change demonstrated a clear lack of awareness regarding the historical and current significance of the terms in question, and a clear disconnection from the legacy of community struggle and sacrifice that it took to build MEChA into the organization that was being represented within that national meeting. Therefore it is more likely that they were not aware of the broader implications of their vote beyond the debate taking place over the dropping of a few words. This report is the first of three parts of Unión del Barrio’s Report & Analysis On The 2019 MEChA National Conference. The subsequent two parts will be published shortly. (1) – There are hundreds of independent MEChA groups across the U.S. that are not affiliated to the national structure. (2) – There is a lack of clarity in terms of the vote in favor of the resolution. The final count was 29 in favor, 3 opposed, 2 abstentions, but there were some chapters that did not have their vote officially counted for multiple reasons, for example at least one left before the vote took place. Therefore these numbers and the list is an approximation of the results. We ask that the chapters that are listed incorrectly please let us know and we will update this document right away. Updates, on 04/04/2019 Santa Barbara City College was removed from the list of chapters voting in favor of the resolution. Members of that chapter clarified that they did not participate in the vote. Oregon State University was also added to the list, and noted as the chapter that seconded the motion to change the name. This entry was posted in 2019, Analysis, Analysis, Cultural News & Events, Event, Higher Education News & Events, History, History, K-12 News & Events, La Lucha Indígena, La Mujer News & Events, LGBTQ Struggle, Neoliberalism, Nuestra América, Organizational Updates, Prison Work News & Events, Self-Determination, Solidarity, Venezuela. Bookmark the permalink.